Ryan's Recipes Food from all around the world -- recipes, gardening, cooking, grilling, and more. 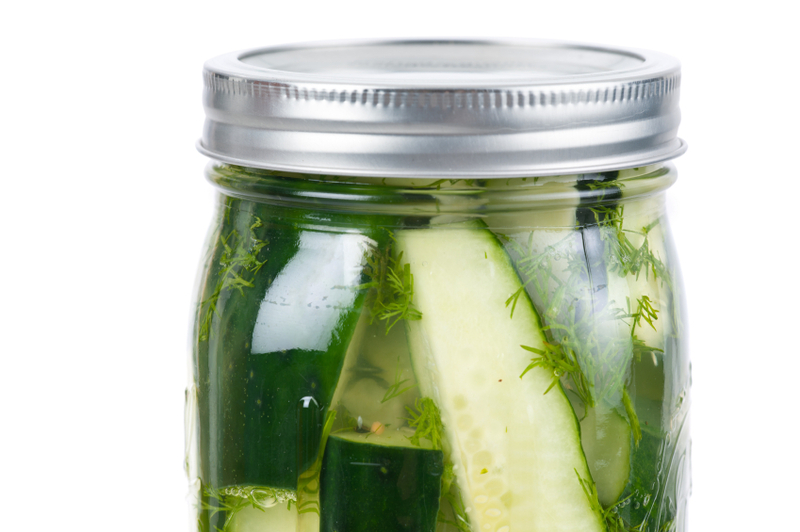 Now you don’t have to buy pickles at the store again, because this recipe is easy and quick! You should be done in about 10 minutes. It does take a few days for the pickles to infuse and be ready to eat, but the preparation is a piece of cake. Add sliced cucumbers, garlic, and bay leaves to 2 Mason jars. Add all other ingredients to a small saucepan over high heat. Cook until it begins to boil and salt/sugar dissolves. Pour carefully the hot liquid equally into the 2 Mason jars. Seal, and allow to cool to room temperature. Refrigerate for 2-3 days before serving. Then eat! As you might already notice, this recipe is quite flexible. You can use carrots or cauliflower instead of cucumbers. You can add jalapenos or chilies if you want it spicy. You can also add other ingredients to make it international (ie. cumin for Indian flavor; or rice wine vinegar, sugar, and no dill for Asian). If you wish to make cucumbers for long-term storage, change recipe to 1 cup vinegar and 2 1/2 cups water. Refrigerate for 1 week prior to serving.